Here you can find the Color Pool Pavilion with rainbows’ seven colors, Malay River Springs and other oriental featured springs. 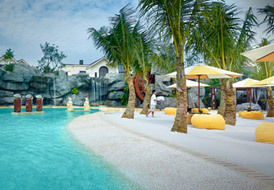 You can also refresh and cool yourself in various waterfall massage pools inside the Tropical Orient. Malay River Springs is originated from the traditional Malay circulating bath which villagers bathed in streams or rivers. You can experience their culture and refresh your senses here. Soak in a hot springs with Bali sculpture and various essential oil let you experience foreign country’s custom, enjoy the journey to health and beauty. 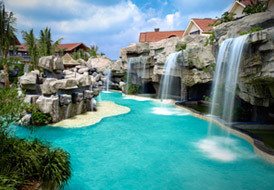 Element:Waterfall massage let you escape from busy city to the soothing nature world, wash your tiredness away. You can get a real relaxation and liberation here.